Post away. Give me a picture of what's on your workbench today. Daily, weekly, whatever. Come on, what is laying there you are working on, or need to put up that's in the way. Here's mine today. Not much going on, just a table to repair the leg on. Seat blank for a Windsor Chair. Some layout lines, and leg holes drilled. Been there for almost two weeks. Pondering what to do with it. Your cat has poor taste in beer. (01-21-2018, 12:36 AM)jteneyck Wrote: Your cat has poor taste in beer. So yer working on the cat while the cat is drinking beer. Ed, that's an awesome looking shop. And I like the cat, too. Is that a Bobcat sitting in the back? I'd be jealous beyond belief if it is. I'm already jealous of all the space. Parts for a shooting board plane. This is a joint venture with engraver Catharine Kennedy. 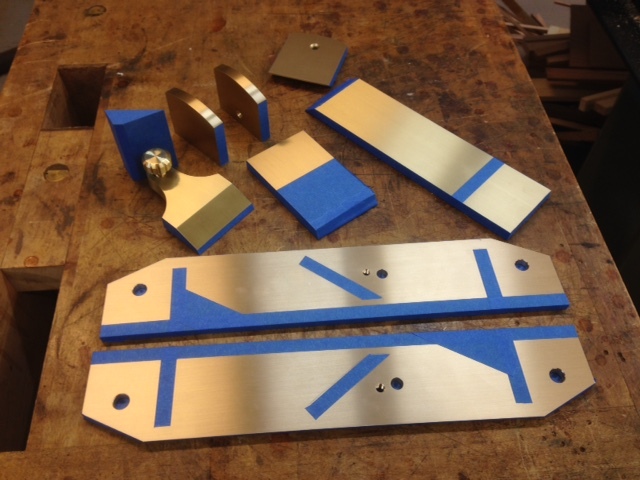 Parts are masked and ready for the engraving of the interior surfaces. The parts will then come back to me for assembly and then back to Catharine to engrave the exterior surfaces, and then back to me for final touches, tuning and photography. Everything is brass except for the knob and iron. Final result is a brass bodied plane engraved inside and out. "which plane should I use for this task?......the sharp one"
(01-21-2018, 10:30 AM)jteneyck Wrote: Ed, that's an awesome looking shop. And I like the cat, too. Is that a Bobcat sitting in the back? I'd be jealous beyond belief if it is. I'm already jealous of all the space. Yes, thats my trusty old 743. (01-21-2018, 12:42 AM)EdL Wrote: No......just me. Busch light is also my choice for shop beer; I try and not to confuse myself.